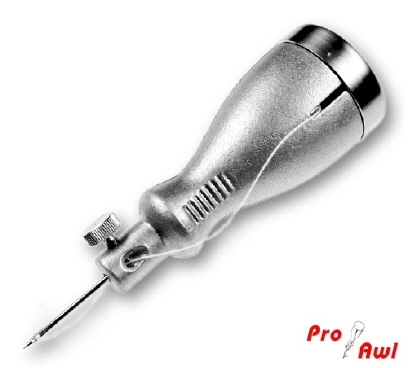 Here you will get all the information on the Pro-Awl, the practical and professional sewing tool for craftsman and handyman that should not be missing in any household. The Pro-Awl will be delivered ready for use with high-quality needles, thread and bobbin. Everything packed in the stable hollow handle, completely made of metal. It can be used for smaller or larger sewing jobs to be made – quick and durable. It is especially useful for places which are difficult to reach like the repairing of an awning. The Pro-Awl is made of best materials. Handle, Lid, Screw etc. are made of rustproof metal. The needles are due to high industrial standard and we only use tested thread. Our Pro-Awl is a high-quality product which will give you pleasure for a very long time.